Really nice work on the Novik, eagerly waiting for more of your amazing work! At least texture mods worked on the latest test server IIRC. I just had to install them in res. I know it's risky but the I figured the test server was a safe environment and it worked well enough. Should I skip the Colorado? Tried a few games on her back in the CB and felt like she was a fine ship. Whats your most fun to play Class of ships ? Cruisers are my favourite, liked DDs a lot back in CBT too. BBs are OK too but CVs are not for me. If I want to play RTS I play an RTS, not WoWs. 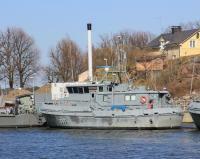 MS Kielimuuri for Finnish Navy training ship Axel von Fersen. The name means "language barrier" because the Swedish speaking officer trainees are usually stationed on her. Puuhamaa (name of a Finnish amusement park) for the Pohjanmaa, the previous flagship. 4.0.1 what will come thıs update? So I should get negative 20-40 latency? That'd be great, see stuff before it happens! Just came back from my last game before the wipe. Defeat on the Colorado. Time to say goodbye, to my New Orleans, The Colorado, Mahan, Cleveland and Minekaze. See you soon. BB will most probably be one of the H-class designs. Probably H-41 or H-42. Which line are you starting with in OBT? Guess I'll be playing USN CA and BB at first, those have been the lines I most enjoyed during the closed beta. Might also try IJN cruisers.